Graphite is an excellent electrode material, but all graphites are not alike. 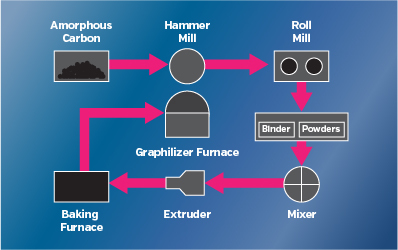 Because EDM graphites are manufactured, each maker of graphite materials uses different processing techniques, source materials and process controls. The basic process may be similar, but the end product will be quite different. Each manufacturer will also make several grades of graphite that are designed for different purposes. The manufacture of graphite was made possible by the development of high temperature electric furnaces near the end of the 19th century. The basic process has changed little since E.G. Acheson was granted a patent in 1896 for the manufacture of graphite in such a furnace (figure 5-1). The raw material for most manufactured graphites is calcined petroleum coke (amorphous carbon). The calcined coke is then milled to various particle sizes. Desired blends of coke particles are then mixed with coal tar pitch. This mixture is then pressed or extruded into billets. The billets are baked in an oxygen-free atmosphere to drive off the volatiles from the pitch. The result is an amorphous carbon product which is held together with carbonaceous pitch residue. This carbon is transformed to graphite (graphitized) by further heat treating at extremely high temperatures. Figure 5-1. Typical graphite process. POCO graphite is made by a proprietary process which results in a graphite that is as improved in its qualities from ordinary graphite as tool steel is over iron. POCO graphite was developed in the 1960's as a heat shield material for manned spacecraft. Today, POCO graphites are used in experimental fusion reactors, artificial heart valves, spacecraft, the computer industry, and other advanced and experimental technologies, including some extremely severe applications where only POCO graphites qualify. Since all graphites seem to look alike, the EDMer needs to understand the importance of the graphite properties and how these properties influence the EDM process. One characteristic of many manufactured graphites is that, like wood, they have a definite grain orientation. This can be seen in figure 5-2. Note that the crystal structure is formed in layers. These crystals form crystallites which form the particles or grain. Strength is greater "with the grain" in wood (and graphite) than it is "across the grain". Also, electrical conductivity and other properties in graphite are usually greater with the grain than across the grain. Figure 5-2. The planar structure of ordinary manufactured graphite is responsible for its lubricating qualities and the differences in strength, electrical resistivity, and other qualities related to grain direction. Special POCO processing steps virtually eliminate with and across grain differences. The particles may have a preferred orientation of crystallites within the individual particle, plus the billet may have a preferred orientation of particles within it. These particles may be large and irregular in shape and size, creating a non uniform structure (figure 5-3). Unfortunately, the grain in graphite is not visible to the unaided eye as it is in wood. Therefore the electrode fabricator cannot take advantage of working with the grain. This grain is responsible for the anisotropy of ordinary graphite. 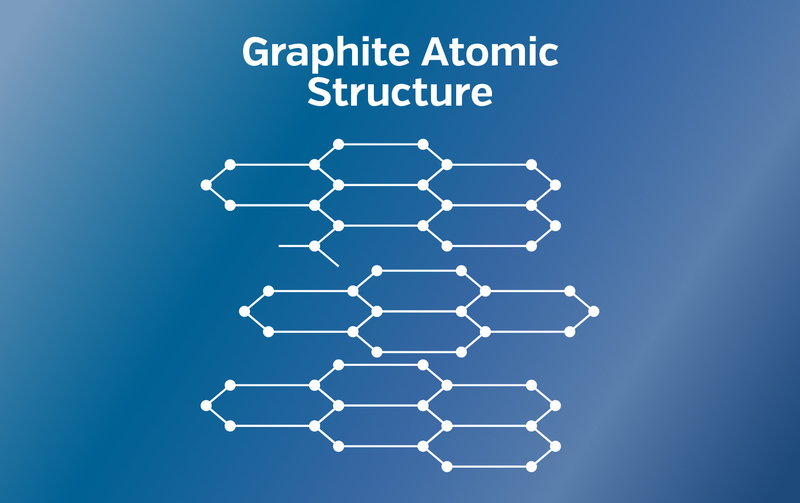 The structure of POCO graphite is unique. The particles are all the same small size and are rounded. The pores are also small, typically less than 1 micron. Because the particles tend to be round, they do not have a major axis. 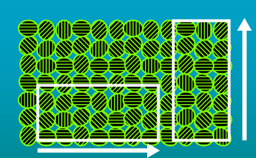 No orientation effects are possible (figure 5-4); therefore POCO graphite has no preferred grain orientation and the materials are called isotropic. Properties such as strength and electrical resistivity are the same in all directions. The isotropic nature of the materials means that electrodes machined from any part or orientation of a billet or from different billets offer the same performance characteristics. Angstrofine has a typical particle size of less than 1 micron. 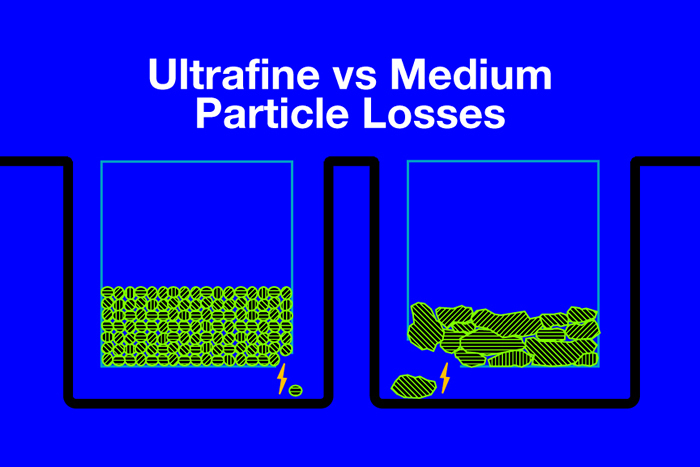 Ultrafine has a typical particle size of 1-5 microns. Superfine has a typical particle size of 6-10 microns. Fine has a typical particle size of 11-20 microns. Medium graphites have particles that range in size from 21 to 100 microns. Each manufacturer may produce several grades within a given classification. It is important to realize that not all manufacturers make graphites that fall into all classifications. Premium graphites, those with a particle size of 5 microns or less, are difficult to manufacture. Particle size is one of the most important qualities of graphite. Angstrofine class graphites have particle sizes of less than 1 micron (one millionth of a meter or 39 millionths of an inch) in diameter. Many commonly encountered EDM graphites have particle sizes much larger (figure 5-5). The dark regions in the photos represent the porosity, while the lighter regions represent the graphite particles that are bound together by chemical or mechanical means. The weakest part of any graphite system is the boundary between particles. Figure 5-5. Microstructure of two grades of graphite. 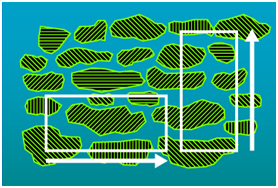 The nature of the EDM process causes particles from the electrode to be lost (figure 5-6). The material loss is more critical with large grain graphites. This effect manifests itself not only in increased wear, but also may contribute to DC arcing. These large particles tend to clog the gap which could result in reduced cutting speed due to the instability of the cut. This is especially apparent under poor flushing conditions. When using large grain graphites, even advanced machines with automatic sensing could be slowed considerably as they attempt to keep the gap clear. Particle size also has a bearing on the minimum surface finish value that can be obtained. During finishing operations at low power and a high frequency, the electrode will tend to reproduce its structure in the workmetal finish. A coarse grain graphite with large particles and pores will not produce a better finish than the surface of the electrode. Figure 5-6. Particle size and EDM process. Strength is also related to particle and pore size. The bonds between individual particles in Angstrofine and Ultrafine particle graphites are much stronger than those of coarser classes. Materials with a grain structure tend to be much stronger with the grain than against the grain. POCO graphites have the same strength in all directions because of their isotropic grain structure. Flexural and compressive strengths have importance both in and out of the machine. Many electrodes are broken or damaged before they ever reach the machine simply through rough handling or accidents. Electrodes made from high strength Angstrofine and Ultrafine particle graphites will take much more abuse without chipping or breaking. Higher strength also means that it is possible to machine tiny free standing ribs and other fine details. For detailed work, look for materials with flexural strengths above 10,000 psi. Typical effects of materials that have low strength include breaking and chipping during machining of thin walls and fine detail. Once in the machine, thin ribbed electrodes can be deflected by flushing pressure if the material does not have adequate flexural strength. High strength also means improved wear resistance since a stronger material better resists the damaging effects of electrical discharge machining. Density is the ratio of the mass of the graphite to its volume. Most EDM graphites will have an apparent density between 1.55 and 1.85 g/cm3. It is recommended that the density value and a photomicrograph of the material be taken into consideration when comparing materials. Graphites with very large particles and pores can have higher density values than some of the best small particle and pore sized materials. Generally, the physical and mechanical properties (such as strengths) improve as the density is increased within a classification of materials from a given manufacturer. Materials with high density along with tightly packed small particles will give better wear and finer finishes than materials with a high density and large, loosely packed particles. In graphite, the particle and pore size along with the apparent density have an influence on the hardness value. The hardness can also be changed by the graphitization temperature. Most EDM graphites fall within a Shore hardness range of 45 to 85. The most machinable materials will be between 55 to 75 on the Shore scale. The hardness of the material is particularly important when fabricating the electrode. The harder the material the more difficult it is to machine without chipping the electrode. Hardness does not affect EDM performance. The Electrical Resistivity (ER) is the property that determines the material's resistance to the flow of an electrical current. Materials with lower ER values are better conductors than materials with higher ER values. Density of the material will affect the electrical resistivity. As the density of the graphite increases within a given classification of materials from a given manufacturer, its electrical resistivity decreases. The electrical resistivity value rarely has meaning to the EDMer. The exceptions would be working with thin ribs and rods. Thin ribs could overheat if the ER is too high. The energy would dissipate in the electrode, causing it to act like a heater. When small hole drilling with multiple rods, the ER should be uniform. The speed of the cut is dependent on the slowest electrode. There are five classes of graphite and three groups of metallics suitable for use as EDM electrodes. The following table summarizes what we have covered concerning electrode material groups and classes. Micro holes 0.0003" to 0.0009" dia.